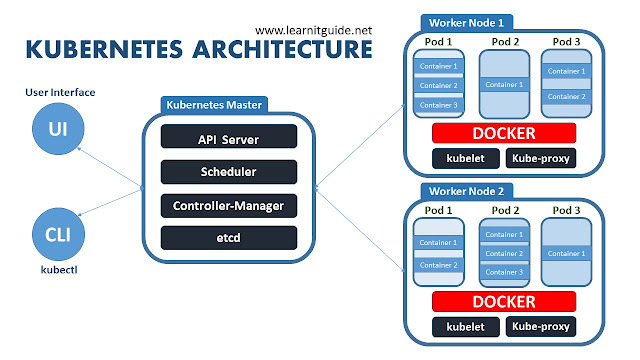 Kubernetes is an orchestration engine and open-source platform for managing containerized application workloads and services, that facilitates both declarative configuration and automation. Kubernetes is also commonly referred as K8s. Actually, Kubernetes is not a replacement for Docker, But Kubernetes can be considered as a replacement for Docker Swarm, Kubernetes is significantly more complex than Swarm, and requires more work to deploy. Kubernetes can speed up the development process by making easy, automated deployments, updates (rolling-update) and by managing our apps and services with almost zero downtime. It also provides self-healing. Kubernetes can detect and restart services when a process crashes inside the container. Kubernetes is originally developed by Google, it is open-sourced since its launch and managed by a large community of contributors. It makes better use of hardware to maximize resources needed to run your enterprise apps. It can be used to Scale containerized applications and their resources on the fly. Any developer can package up applications and deploy them on Kubernetes with basic Docker knowledge. Kubectl is a command line configuration tool (CLI) for Kubernetes used to interact with master node of kubernetes. Kubectl has a config file called kubeconfig, this file has the information about server and authentication information to access the API Server. Kubernetes Master is a main node responsible for managing the entire kubernetes clusters. It handles the orchestration of the worker nodes. It has three main components that take care of communication, scheduling and controllers. API Server - Kube API Server interacts with API, Its a frontend of the kubernetes control plane. Scheduler - Scheduler watches the pods and assigns the pods to run on specific hosts. Kube-Controller-Manager - Controller manager runs the controllers in background which runs different tasks in Kubernetes cluster. Node controller - Its responsible for noticing and responding when nodes go down. Replication controllers - It maintains the number of pods. It controls how many identical copies of a pod should be running somewhere on the cluster. Endpoint controllers joins services and pods together. Services account and Token controllers handles access managements. Replicaset controllers ensure number of replication of pods running at all time. Deployment controller provides declarative updates for pods and replicasets. Daemonsets controller ensure all nodes run a copy of specific pods. etcd is a simple distribute key value store. kubernetes uses etcd as its database to store all cluster datas. some of the data stored in etcd is job scheduling information, pods, state information and etc. Worker nodes are the nodes where the application actually running in kubernetes cluster, it is also know as minion. These each worker nodes are controlled by the master node using kubelet process. Container Platform must be running on each worker nodes and it works together with kubelet to run the containers, This is why we use Docker engine and takes care of managing images and containers. We can also use other container platforms like CoreOS, Rocket. Kubelet is the primary node agent runs on each nodes and reads the container manifests which ensures that containers are running and healthy. Kube-proxy is a process helps us to have network proxy and loadbalancer for the services in a single worker node. It performs network routing for tcp and udp packets, and performs connection folding. Worker nodes can be exposed to internet via kubeproxy. A group of one or more containers deployed to a single node. Containers in a pod share an IP Address, hostname and other resources. Pods abstract network and storage away from the underlying container. This lets you move containers around the cluster more easily. With Horizontal Pod Autoscaling, Pods of a Deployment can be automatically started and halted based on CPU usage. A deployment is a blueprint for the Pods to be created. Handles update of its respective Pods. A deployment will create a Pod by it’s spec from the template. Their target is to keep the Pods running and update them (with rolling-update) in a more controlled way. Pod(s) resource usage can be specified in the deployment. Deployment can scale up replicas of Pods. A service is responsible for making our Pods discoverable inside the network or exposing them to the internet. A Service identifies Pods by its LabelSelector. Hope you have got an idea about basics and introduction of kubernetes. In the next post, we have shown you How to Install & Configure Kubernetes Cluster with Docker on Linux. Going forward we will play more with kubernetes cluster. Keep practicing and have fun. Leave your comments if any.